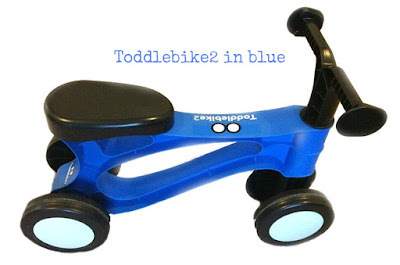 I first heard about 'balance bikes' a few years ago whilst Teaching Reception year at school. Until then, I really hadn't seen the point in a bike without any pedals...surely it defeats the object?! However, after taking part in a training session with my class and seeing the massive impact that the balance bikes had and the obvious progression in skills I am now a total convert. We have one ready for Arthur when he is big enough which his Grandparents bought for him last Christmas, and I really have been itching for him to be able to use it! 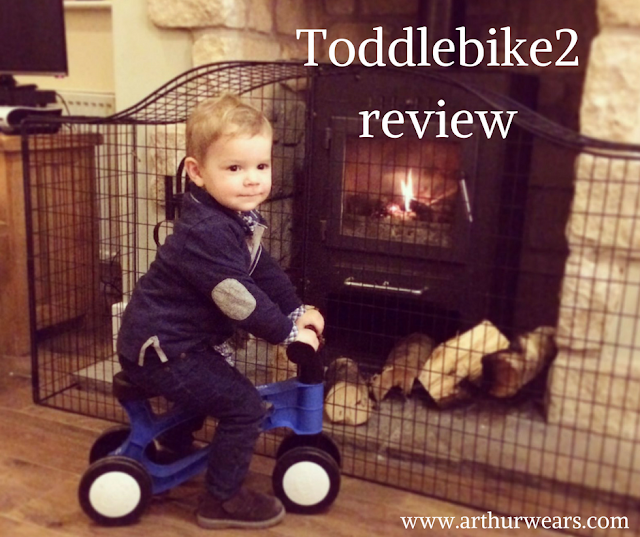 You see, Arthur is a very active little boy and he LOVES pretty much anything with wheels. One of the great things about this bike is that it is so lightweight (less than 1kg)! Arthur picks this up himself with ease which makes is super easy to get yourself out of a tight spot! This is so easy to clean as it is made from hardwearing plastic, which means you can easily use outside, give it a rinse and a dry and then bring it back inside. We have used ours inside mainly because it has just been so wet and miserable lately ( and our Toddlebike arrived on the day that it snowed!!). The only thing I will say is that the plastic wheels were a little bit slippy on our laminate floor at first, but now that it has been used for a couple of weeks it has a bit more 'grip!'. Obviously, this is where rubber wheels would help, but of course this would increase the weightof the product. ...but seriously, what a brilliant piece of equipment! When I first opened it I was a little bit worried as to just how sturdy it would be but it has surpassed my expectations. I'll be honest, (because this is of course an honest review!) and I know I wont be alone in admitting using a toy outside of the recommended age limits - but my 6 year old Neice spent just as much time on this Toddlebike during our recent Family weekend in Northumberland as Arthur did. In fact, at one point they were both sat on it and it survived the holiday and came home completely intact. I'm not recommending you try this of course, just pointing out how deceptively tough this little bike really is! Speaking of Northumberland, it was amazing to be able to pop the Toddlebike in the car, on top of our luggage, knowing it was light enough and small enough to just take away with us easily. There were no toys etc at the cottage we stayed in and this little bike was our saviour in helping a very energetic toddler burn off come energy whilst it was -5 degrees outside! I can't recommend this highly enough, I just wish we had found out about it sooner! 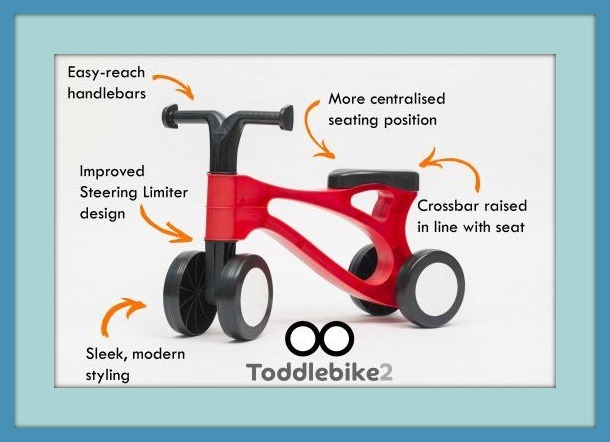 You can purchase your own Toddlebike2 via the Toddlebike website or through their Amazon shop. Disclosure: We received this Toddlebike2 in return for an honest review. I so wanted one of those! But my Baba is too small for the moment! Love the colour and teh nice features! I def have it on my shopping list for later on. your little one seems to love it!!! So cute that he was wondering about pedals!He is veyr logical! I wondered too at first hahaha. Thanks so much for linking up at #KCACOLS. Hope you come back again next Sunday. Ive looked at these before, they look really good. Perky may find herself with one for her birthday. I didn't see the point of a bike with no peddles either butI get it a bit more now. We went for peddles and stabilisers with our eldest because it was more suitable for her but I think a balance bike will be better for her little sister.